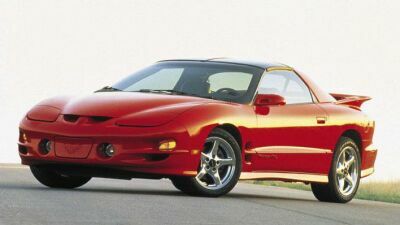 Comments: The Pontiac Firebird was released five months after the Chevrolet Camaro, and offered buyers choices of six and eight cylinder engines. 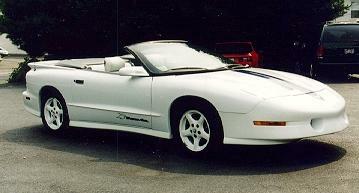 Pontiac was able to use that additional time to create a unique identity for the Firebird, despite having to use the Camaro chassis and some body panels. 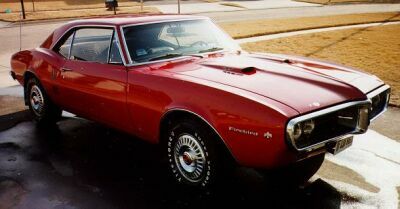 Despite using the same front fenders, doors, and rear fenders as the Camaro, the Firebird’s styled split front grille, beaked hood, and GTO-slitted taillights gave it a distinctly Pontiac appearance. But the key difference was under the hood, where the Firebird offered a range of Pontiac engines. Initially, five different Firebirds were available, named after their respective engine choices. At the bottom was the lowly 230 cubic inch OHC six cylinder engine with a single 1bbl carb, rated at a measly 165 bhp. Stepping up to the “Sprint” version got the buyer a 230 I6 with a 4bbl carb rated at 215bhp. Either six cylinder was linked to either a three or four speed manual or two-speed automatic transmission. Although the six cylinder engines were more powerful than Chevy’s offerings, most buyers wisely opted for one of the available V8 engines. At the bottom was Pontiac’s 326 V8 with a two barrel carb that was rated at 250 bhp. A special “H.O.” (High Output) version of the 326 V8 fitted with a four barrel carb was rated at 285bhp. At the top was the 400 V8 borrowed from the GTO. This engine was rated at 325 bhp, and was available with or without Ram Air (which suspiciously didn’t affect the engine rating). The Ram Air engine included a hotter cam, stronger valve springs, and made use of the otherwise decorative hood scoops. With no publicized power increase and a hefty $600 price tag, the Ram Air option was rarely ordered. All V8s came with a standard heavy-duty three speed manual transmission; a four speed manual and two and three speed automatic transmissions were optional. Performance axle ratios up to 4.33:1 were available as well as front disk brakes. Firebird prices were roughly $200 more than comparable Camaros and the Camaro outsold it two to one. But Pontiac’s pony car had arrived. Comments: The Pontiac Firebird underwent a major restyling for the 1969 model year. The front end was redone and the rear end and interior were changed slightly. The redesign did not do well with customers, and sales fell, despite the fact that production lasted for 17 months, well into 1970 due to production problems with the 1970 model. The Ram Air 400 was renamed the Ram Air IV and had a slight increase in power. The 400 HO option was known as either the Ram Air, Ram Air II, or simply HO. It too received a slight increase in power. 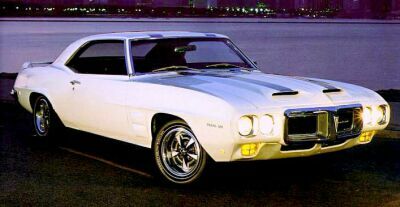 In March of 1969, Pontiac released a little publicized option package, the Trans Am Performance and Appearance Package. Conceived to campaign in the SCCA’s road racing series (with a special 303 cubic inch V8 which was never offered in production cars), Pontiac paid a $5 license fee to SCCA for each Trans Am sold to use the name. Offered as a $725 option, only 689 Firebird coupes and 8 convertibles (talk about a collectible) were built. Although not appearent at the time, the Pontiac Firebird Trans Am, along with the Chevrolet Corvette, would be the only American high performance cars that would remain in continuous production since their inception. The Trans Am came standard with the HO engine with Ram Air (also called the Ram Air III). The only engine option was the 400 Ram Air IV, ordered on just 55 coupes. All Trans Ams were Polar White with blue racing stripes, tail panel, and decals. The exclusive hood had functional air intakes which could be closed by the driver and functional fender scoops designed to vent the engine bay. A 60 inch rear foil (spoiler) was mounted on the trunk. Although the Trans Am was no faster than similarly equiped Firebirds, it represented the peak of Pontiac performance excitement. Introduction: The second generation Firebird saw the Firebird becoming more like a Camaro, but Pontiac still had a few more tricks up its sleeve, especially under the hood. 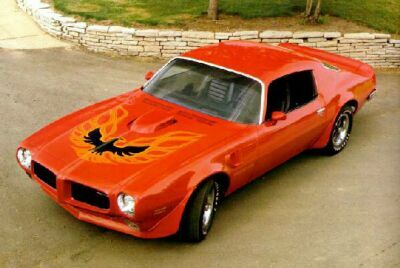 Nothing would rule the mid 1970s quite like the Firebird. lineup was reduced from six to four, and the convertible was eliminated. At the bottom of the line up was the Base Firebird, whose Pontiac 250 I6 was replaced by a Chevy built 250 I6 rated at a meager 155bhp. Most buyers wisely opted for one of the optional V8s. Next up was the Espirit, which featured the Pontiac 350 V8 rated at 255 bhp. The Formula 400 featured a unique twin-scooped hood with a 400 V8 rated at 335 bhp. At the top was the Trans Am, which was fitted with air dams across the bottom of the front and in front of the wheels. A large decklip lip and small spoilers in front of the rear wheels completed the package. These aero pieces were claimed to generate 50 pounds of downforce on the front and rear of the car at highway speeds. Trans Ams also received a rear facing shaker hood scope to feed the standard Ram Air II engine. Optional on the Trans Am was the Ram Air IV engine, whose output had increased to 370 bhp due to bigger ports, better heads, swirl-polished valves, and an aluminum instake manifold. Only 88 copies were made. Rarer still was the Ram Air V, an over-the-counter, special order engine that included solid lifters and tunnel port heads and made up to 500 bhp. A four speed Hurst shifter was standard, but a three speed Turbo Hydra-matic automatic was available. Inside, complete instrumentation, including a tach turned on its side to red line at 12 o’clock just like a race car, completed the performance image. The Trans Am featured one of the best tuned suspensions of any car (including the Corvette) and its European styling gave it instant class. The Trans Am was now available in either Polar White or Lucent Blue, with contrasting stripes, a relatively modest bird stencil at the tip of the nose, and the words “Trans Am” across the rear spoiler. Engines: 250 I6 155 bhp. 350 V8 255 bhp. 400 V8 265 bhp. 400 V8 330 bhp @ 4800rpm, 430 lb-ft @ 3000 rpm. 400 V8 (HO) 335 bhp @ 5000rpm, 430 lb-ft @ 3400 rpm. 400 V8 (Ram Air II) 345 bhp @ 5000 rpm, 430 lb-ft @ 3400 rpm. 400 V8 (Ram Air IV) 370 bhp @ 5500 rpm, 445 lb-ft @ 3900 rpm. 400 V8 (Ram Air V) 500bhp. Comments: 1971 saw little styling change for the Pontiac Firebird, with the addition of high-back bucket seats being the major appearance change. Rather, the major changes were under the hood. In order to satisfy General Motors decree that all engines had to run on unleaded gasoline to meet federal emission standards, the engine options were significantly altered. A new 400 V8 rated at 300 bhp was added, but both 400 Ram Air engines were dropped. In their place were two new 455 V8s, rated at 325 bhp and 335 bhp. The 455 HO engine was only available in the Trans Am and borrowed the cylinder heads from the 1970 Ram Air II and the intake manifold from the 1970 Ram Air IV. The Trans Am continued with its blue and white paint scheme, functional rear facing engine shaker hood scoops, and aero body pieces. Although the 455 engines available in the Trans Am were less powerful than the 1970 Ram Air II and IV engines, their 480 lb-ft of torque and less tempermental nature made them easier to drive on the street and were one of the high points in a time when performance was on the decline. Engines: 400 V8 300 bhp @ 4800rpm, 400 lb-ft @ 3600 rpm. 455 V8 325 bhp @ 4400 rpm, 455 lb-ft @ 3200 rpm. 455 V8 (HO) 335 bhp @ 4800 rpm, 480 lb-ft @ 3600 rpm. Comments: 1972 was a disasterous year for the Firebird. GM executives considered dropping the Firebird altogether as sales fell drastically as the muscle car market collapsed, which was worsened by a crippling 174 day strike at the only plant that produced Firebirds. Pontiac executives were able to eventually save the Firebird and it continued, with very little change from 1971, except that its engines were now rated in net SAE numbers. Pontiac’s famous “honeycomb” wheels also made their first appearance in 1972. Engines: 400 V8 250 bhp @ 4400rpm, 325 lb-ft @ 3200 rpm. 455 V8 300 bhp @ 4000 rpm, 415 lb-ft @ 3200 rpm. Comments: 1973 saw some significant new changes to the Firebird, including a new eggcrate grille and a revised front bumper. Engine ratings were down again, with the 350 rated at a mere 150 bhp and the 400 at 250 bhp. But two things would save the Firebird and firmly establish Pontiac as the performance manufacturer during the dark days of the 1970s. The first was the introduction of a new Super Duty 455 V8 (SD-455). “Super Duty” was the name Pontiac used on its high performance (i.e. race ready) engines in the early 1960’s, and the Super Duty 455 was a street legal race prepped engine. All SD-455’s were hand assembled, and had a reinforced block, special cam shaft, aluminum pistons, oversize valves and header-like exhaust manifolds. Pontiac rated the SD-455 engines at a stout 310 bhp and 390 lb-ft, but experts agreed that it was closer to 370 bhp. This level of engine ratings were unheard of in an era when other manufacturer’s engines’ output were falling dramatically, and the Firebird became the only true performance car remaining in the market. Unfortunately, Super Duty engines were expensive and therefore rare; only 252 Trans Am’s and 43 Formula 455’s received the SD-455 engine. 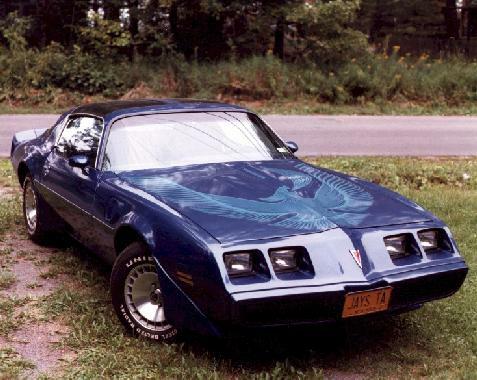 The second major coup for the Firebird was the introduction of a new Firebird decal on the Trans Am, which covered almost the entire hood and was quickly nick-named “the screaming chicken,” which added to the excitement and popularity of the entire Firebird lineup. Sales of the Firebird and Trans Am were up dramatically, ensuring their survival. Engines: 350 V8 150 bhp. 400 V8 230 bhp @ 4400rpm, 325 lb-ft @ 3200 rpm. 455 V8 250 bhp @ 4000 rpm, 370 lb-ft @ 2800 rpm. 455 (SD) V8 310 bhp @ 4000 rpm, 390 lb-ft @ 3600 rpm. Comments: 1974 was a difficult year for the Firebird. Gone was the Endura bumper, replaced by new, Federally mandated, fiberglass front end with a slight wedge shape and rubber covered 5 mph bumpers. The chrome rear bumper was also gone, replaced by those pesky rubber bumpers. Engine ratings dropped again with the Trans Am’s base 400 V8 engine rated at 225 bhp. But for a mere $57, buyers could order the 250 bhp 455 V8, which received a 10 lb-ft boost to 380 lb-ft, but which came only with an automatic transmission. The mighty Super Duty 455 V8 was also available for an additional $578 and were unchanged from the year before. All V8s included true dual exhausts, which made their last appearance on the Firebird. Also available for the last time on the 1974 Firebirds were the Muncie 4-speed manual transmission and the TurboHydramatic 400 automatic transmission. The lower output of the 1975 engines would make those heavy-duty transmissions unnecessary. This would also be the last year of the Super Duty engines. Engines: 350 V8 155bhp. 400 V8 225 bhp @ 4000 rpm, 330 lb-ft @ 2800 rpm. 455 V8 250 bhp @ 4000 rpm, 380 lb-ft @ 2800 rpm. 455 (SD) V8 310 bhp @ 4000 rpm, 390 lb-ft @ 3600 rpm. Comments: In what had been a sea of pony car competitors, the Pontiac Firebird was all alone for 1975. The Camaro Z28, AMC Javelin, Plymouth Barracuda, and Dodge Challenger all were discontinued. The Ford Mustang was now offered on a Pinto platform and boasted a top engine offering of a 105 bhp 2.8 liter V6! 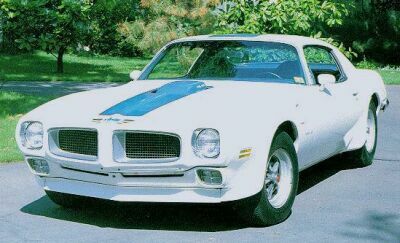 The 1975 Firebird featured a new front end (it’s third in three years) and a much improved rear window, which greatly improved visibility. The instrument panel stayed the same, but the old 160 mph speedometer was replaced by a new 100 mph unit, to better reflect the new times. The base 400 cid V8 Trans Am engine put out a pitiful 185 bhp, but still cranked out 310 lb-ft of torque. But the big news was what was lost: No Super Duty 455 engine, no Turbo-Hydramatic 400 automatic transmission, no Muncie Four-Speed Manual Transmission, no true dual exhausts. The main culprit: the new Federally mandated Catalytic Converters. The 455 V8 was re-introduced mid-year in “H.O.” guise, but it was just the 455 engine from the Bonneville and produced only 200 bhp. Engines: 350 V8 155bhp. 400 V8 185 bhp, 310 lb-ft. 455 V8 200 bhp @ 3800 rpm, 330 lb-ft @ 2000 rpm. 455 (HO) V8 200 bhp. Comments: 1976 would be the last year of the 455 engine, and the first year of available T-Tops. All Firebirds received new more angular bumpers which improved their appearance, and Pontiac introduced the very popular Black-and-Gold Special Edition Trans Am which quickly became one of the most famous Trans Am’s of all time. This would be the first year that over 100,000 Firebirds were sold. Engines: 350 V8 155bhp. 400 V8 185 bhp, 310 lb-ft. 455 (HO) V8 200 bhp @ 3800 rpm, 330 lb-ft @ 2000 rpm. Comments: 1977 saw a new “Batmobile” front end with quad square headlamps and ever more complex engine choices. The Chevy inline six was dumped for a Buick 231 cubic inch (3.8 liter) V6 as the base engine. A new 301 (4.9 liter) V8 rated at just 135 bhp was available in Esprits and Formulas, with the familiar 350 was optional. 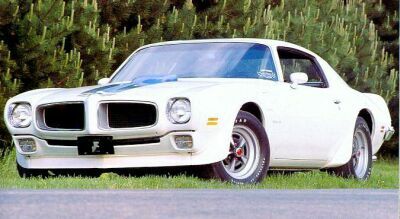 Trans Am’s featured either a Oldsmobile 403 (6.6 liter) V8 or the Pontiac 400 (T/A 6.6) engine under their shaker hood. Meanwhile, Firebirds sold in California had to make due with Chevy 305 and 350 V8s to meet the state’s strict emission laws. But 1977 would the year that firmly established the Firebird as the performance car of the 1970s. Burt Reynolds drove a Black-and-Gold Special Edition Trans Am in the unexpected movie hit “Smokey and the Bandit”, that drove the Firebird’s popularity (and sales) to new heights. Engines: 231 V6 105 bhp. 301 V8 135 bhp. 305 V8 (California). 350 V8 (California). 350 V8 155bhp. 400 V8 185 bhp, 310 lb-ft. 403 V8. Performance: 400/185: 1/4 mile in 16.02 sec. @ 89.64 mph. Comments: Attempting to capitalize on its new found popularity, Pontiac offered a slew of Special Edition Firebirds including a Gold Trans Am with brown accents and Blue “Sky Bird” and Red “Red Bird” Firebirds. Sales soared to a record 187,285 units, including 93,341 Trans Am’s. Comments: As the 1970s drew to a close, the 1979 Pontiac Firebird received a new nose, with the four rectangular headlights all in their own bezels, and the split grille was moved below them. The rear end featured blackout panels disguising the taillights on Formula and Trans Am models. All models also received some revised graphics. 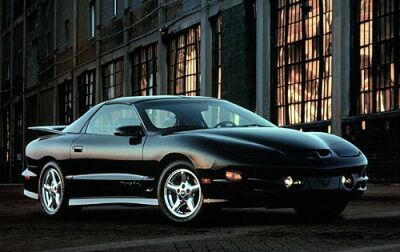 A special silver 10th Anniversary edition Trans Am was sold in what would be the last year for the Pontiac 400 engine. Comments: In perhaps the ultimate insult to the Firebird, Pontiac dropped its 400 V8 and installed a new Turbo-charged 301 (4.9 liter) V8 as its top engine choice. The notorious “Turbo 4.9 was rated at a pathetic 210 bhp, but the real insult came from its actual performance. There was no Turbo boost indicator as Turbo lag was a huge problem and the engine often made loud pinging sounds under heavy loads just before it self-destructed. Nevertheless, a Pontiac Trans Am paced the Indianapolis 500 race that year. Sales dropped considerably. Comments: The disasterous Firebird of 1980 continued into 1981 as sales dropped to just 38% of just two years before. 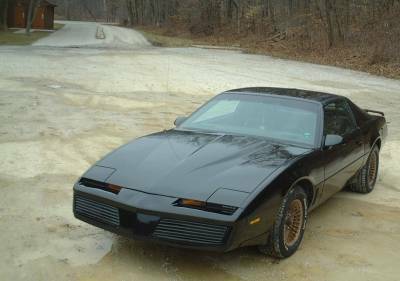 fans was the debut of “Kitt”, a talking Black Trans Am that could out-act David Hasselhoff on the hit TV show “Kight Ridder”, which further increased the Firebird’s popularity. Engines: 2.5 liter I4 90 bhp. 2.8 liter V6 105 bhp. 5.0 liter V8 145 bhp. 5.0 liter (“Cross-Fire Injection) V8 165 bhp. Comments: Not much changed visually for 1983, but under the hood, things were definitely improving. The S/E’s V6 saw its output rise to 125 bhp and a five-speed manual was now available. A new “L69” 5.0 liter V8 with four barrel carb appeared mid-year with available five-speed manual rated at a somewhat respectable 190 bhp. A new four speed automatic transmission also was available. Engines: 2.5 liter I4 90 bhp. 2.8 liter V6 125 bhp. 5.0 liter V8 145 bhp. 5.0 liter (“Cross-Fire Injection) V8 165 bhp. L69 5.0 liter V8 190 bhp. Comments: Not much changed for 1984 except for the expanded availability of the L69 engine and the discontinuation of the Cross-Fire Injection V8. 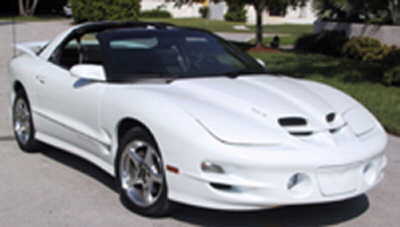 A special white with blue trim 15th Anniversary Trans Am was offered that featured Recarro seats. Engines: 2.5 liter I4 90 bhp. 2.8 liter V6 125 bhp. 5.0 liter V8 145 bhp. L69 5.0 liter V8 190 bhp. Comments: The 1985 Firebird featured a restyled nose, new taillights, and full rocker and quarter panel extensions on the Trans Am to give it a more aggressive appearance. The 5.0 liter V8 was now available with Tuned Port Injection (TPI) which allowed it to produce 205 bhp, although it could only be equiped with the four-speed automatic. A new WS6 suspension package was made available on the Trans Am, which also included 16-inch wheels with huge P245/50VR16 Goodyear “Gatorback” tires. Engines: 2.5 liter I4 90 bhp. 2.8 liter V6 125 bhp. 5.0 liter V8 145 bhp. 5.0 liter TPI V8 205 bhp. Comments: An ugly Federally Mandated Center High Mounted Stop Light (CHMSL) installed in a blister atop the rear hatch’s glass was the only real change for 1986. Comments: A new 5.7 liter (350 cid) V8 with Throttle Body Injection was the big news for 1987. Although rated at just 210 bhp (15 less than the Camaro due to a more restrictive intake), and only available with the four speed automatic transmission, the engine’s high torque rating and flexibility made it the best engine ever yet installed in a 3rd generation Firebird. Furthermore, the 5.0 liter TPI engine was now available with a manual transmission. To further improve the Firebird, Pontiac eliminated the S/E model, the CHMSL bump (it was now incorporated into the spoiler), and the pathetic four cylinder engine. A new budget performance model, the Formula 305, joined the lineup as well as a new top of the line Trans Am called the GTA. Engines: 2.8 liter V6 125 bhp. 5.0 liter V8 145 bhp. 5.0 liter TPI V8 205 bhp. 5.7 liter TPI V8 210 bhp. Engines: 2.8 liter V6 125 bhp. 5.0 liter TPI V8 205 bhp. 5.7 liter TPI V8 210 bhp. 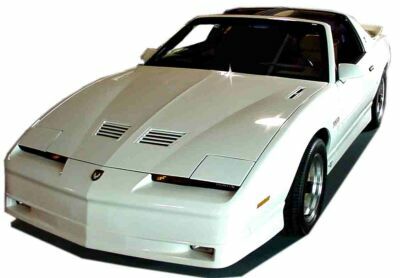 Comments: Pontiac created a special 20th Anniversary edition Trans Am for 1989 by raiding the Buick parts bin. 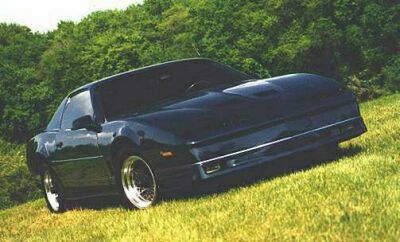 Pontiac took the Buick turbo-charged 3.8 liter V6 (which had gained fame under the hoods of Buick Gran Nationals and GNX), modified the cylinder heads and turbo plumbing, and squeezed it into the Firebird engine bay and hooked it up to a mandatory four-speed automatic transmission. Pontiac conservatively rated the engine at 250 bhp, but most independent testers felt that it made more. This turbo charged beast was relatively easy to live with and truly fast. Furthermore, Trans Am GTAs could also be ordered with a notchback-style hatch, that gave the car the look of a coupe. Performance: 3.8/250: 1/4 mile in 14.2 seconds @ 97.8 mph. 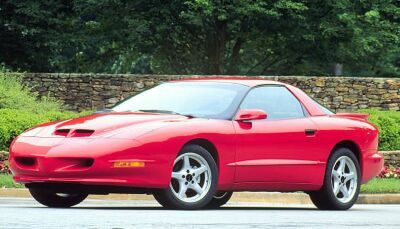 Comments: There were only small changes for the 1992 Firebird, the last year of the 3rd generation. GM added some adhesive to the joints and panels of the car’s structure to quiet squeaks and rattles, and the Performance Equipment Group boosted the TPI 5.7 liter V8 to 230 bhp. Engines: 3.4 liter V6 160 bhp. LT1 5.7 V8 275 bhp. Comments: 1994 saw the reintroduction of the convertible and a special blue and white 25th Anniversary Trans Am. Also new was a GT version of the Trans Am which added additional luxury features such as leather seats. Perhaps most annoying was a new “Skip Shift” feature on the six-speed manual which, depending on throttle position, would force an upshift from first to fourth gear for better fuel economy. This lead to an explosion in aftermarket skip shift eliminator kits. Comments: 1995 saw minimal changes to the Firebird. Traction control was added, the Trans Am GT trim was dropped, and at mid year, GM’s familiar 3.8 liter V6 was offered as an alternative to the 3.4 V6. Engines: 3.4 liter V6 160 bhp. 3.8 V6 200 bhp. LT1 5.7 V8 275 bhp. 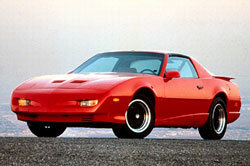 or the Base Firebird which added four-wheel disc brakes, dual exhaust, limited slip differential, and alloy wheels. Formula and Trans Am models saw the 5.7 liter V8 gain 10 bhp for a total of 285 bhp. But now there was a new top engine choice. Pontiac reintroduced their fabled “Ram Air” cold air induction system for the 5.7 V8 as option WS6 available on Formula and Trans Am coupes (not convertibles). Ordering the WS6 package added twin nostrils (air intakes) on the hood which boosted the engine rating to a stellar 305 bhp. 17″ wheels were thrown in for good measure. Engines: 3.8 V6 200 bhp. LT1 5.7 V8 275 bhp. LT1 WS6 5.7 V8 305 bhp. Comments: Not content with 305 bhp, Pontiac replaced the LT-1 with the LS-1 V8 engine, which had first appeared in the 1997 Chevrolet Corvette. The all-aluminum LS-1 was rated at 305 bhp in base trim and 320 bhp in WS6 “Ram Air” mode. Firebirds also received new front end styling, and Base Firebirds could be ordered with a Sport Appearance Package which gave them some of the more aggressive look of their bigger brothers. Engines: 3.8 V6 200 bhp. LS-1 5.7 V8 305 bhp. LS-1 WS6 5.7 V8 320 bhp. Comments: The 1999 Firebird got only minor changes, including a Torsen limited-slip differential for V8 models (and V6s with the Performance Package). A few new options were available, including a Hurst shifter for the six-speed manual transmission and a power steering cooler on V8 models. Pontiac celebrated the Trans Am’s 30th Anniversary with a special White with Blue trim color scheme along with blue-tinted alloy wheels and a white leather interior. Comments: 2001 saw a small increase in engine ratings, with the LS-1 increasing to 310 bhp and 325 with the WS6 option. The Ram Air engine was now no longer available on the Formula trim. Engines: 3.8 V6 200 bhp. LS-1 5.7 V8 310 bhp. LS-1 WS6 5.7 V8 325 bhp. Comments: 2002 would prove to be the last year for the Firebird, and Pontiac decided to issue a special 35th anniversary Firebird (as opposed to Anniversary of the Trans Am). This special model was a Trans Am which featured yellow paint, black wheels, and special graphics. Not really much of a send off for one of only two vehicles (the Chevrolet Corvette is the other) that survived from the muscle car days to the modern era without interruption. There are currently no comments on The history of the Pontiac Firebird. Perhaps you would like to add one of your own?